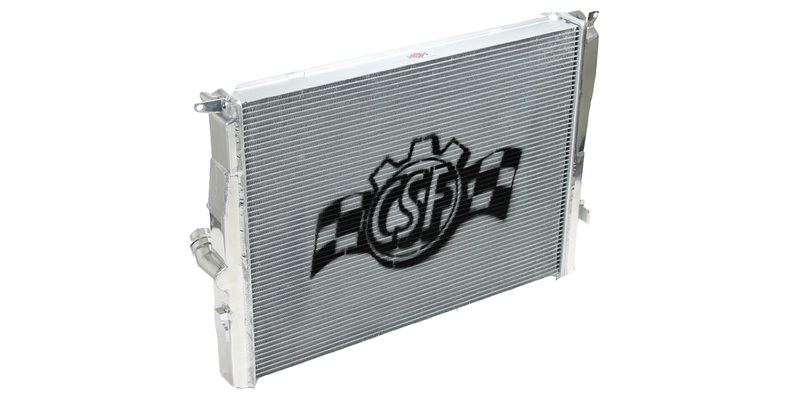 CSF Triple-Pass Aluminum Radiators have been incredibly popular with our customers, and we’ve got our fair share under the hoods of a few of our personal street and track cars around the office. Due to the complexity of a triple-pass radiator and the nature of the internet rumor mill, we feel the need to “clear the air” and offer some helpful details about these high-performance units. Triple-pass radiators are extremely effective but require a bit more diligence when it comes to bleeding the system; if not bled properly, issues may arise. As an example, we ran across a forum thread from an owner of a CSF-equipped BMW who had a problematic cooling issue where the temperature gauge was showing a higher-than-normal temperature (purchased elsewhere without the BimmerWorld technical experience to lean on), and he ended up removing a “bad” unit and replacing with stock. One of our BimmerWorld customers reported nearly identical issues a few weeks later, but based on the description, we knew an incomplete bleeding process would very likely have similar results to what was being described. But not wanting to take any risks, and seeing their was a prior unresolved and reported issue, we immediately had our customer’s radiator returned to CSF for a thorough investigation. The summary of the examination performed by CSF was comprehensive… They inspected the entire system, running a wire scope through the tanks with no findings, and they even went so far as to chop off the tanks for further analysis. The meticulous examination by CSF showed there was no clogging anywhere in the system and all tubes were open with adequate flow. Result? As expected, there was air in the system from an incomplete bleed. So, why are we sharing this information? It’s not purely to show how seriously we take potential issues and how great CSF is to work with (but we are certainly proud to sell a range of hand-picked parts from these types of suppliers that “get it”), but primarily to illustrate the learning experience – and pass it along! With the returned unit passing all tests, this simply proves that the CSF Triple-Pass Radiators require more effort in the bleeding process than standard radiators. We’ve even had the same issues here, despite knowing how complete the bleeding process must be. The fact is, because of the 3-pass design’s longer flow distance and vertically segmented compartments, the bleeding on these particular radiators takes more time and diligence in order to get all the air out of the system. This part of the process is critical for the triple-pass radiator to be able to function as advertised – and it does! We’ve had countless numbers of customers with data showing a consistent 25-30% reduction in temperatures on track. While the bleeding process is crucial for all radiators, this level of thoroughness is an absolute requirement for the triple-pass, 2-row systems. As long as the system is fully bled correctly, the CSF Triple-Pass Radiator is an extremely capable and reliable cooling solution, particularly on track. Additionally, while we often use a specialized vacuum bleeding system, and especially for difficult systems, it is important to note that use of this tool alone (without following the above process) will not guarantee a proper bleed. 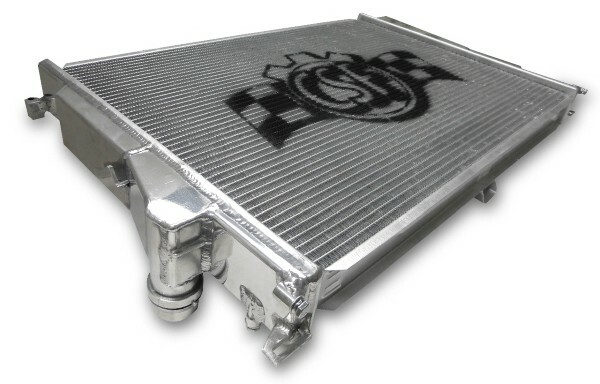 The cooling performance of the CSF Triple-Pass radiator makes this part an ideal choice for track cars, and it’s almost overkill (but perfectly acceptable) for high-performance street use. For those driving in hot ambient temperatures, especially with air conditioning on, heat soak from the AC condenser can affect the last third (in the 3-pass configuration) of the radiator core where the fluid exits. The radiator is working correctly in these conditions, but because of the location of the temperature sensor, the triple-pass configuration is not going to produce a cooler outlet temperature versus a single pass unit – and that is not the intent of this radiator! Despite the factory gauge reading being elevated, temperature probe testing shows that temperatures are well within the range for safe operating (205°), even with the AC on at full blast. 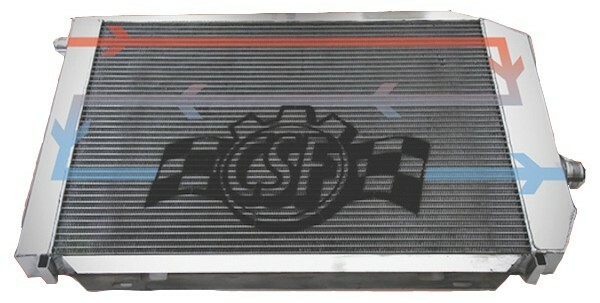 The CSF Triple-Pass Aluminum Radiator is designed to aid your car on track in the most demanding conditions, and has no negative effect versus common street parts in the street environment – and all in a cost-effective package. Is a Strut Brace Worth It?